Mrs. Martha Ann (Cavill) Moore, of 29 Westview Street, West Hartford, was born July 7, 1879 in England, daughter of Elizabeth (Fisher) and Jesse Cavill. She was found injured at the circus grounds after the fire on July 6 and was hospitalized, where after nearly a month of treatment she was recovering well until she became toxic and died from septicemia late in the evening of August 3 at Hartford Hospital. Martha was buried at Rose Hill Cemetery in Rocky Hill after services at Taylor & Modeen Funeral Home on August 7. Mrs. Moore leaves her husband, Walter, 65; two daughters, Mrs. Gladys Delaney of West Hartford and Mrs. Mae Avery of Hartford; and a son, Wilfred Moore of Windsor. 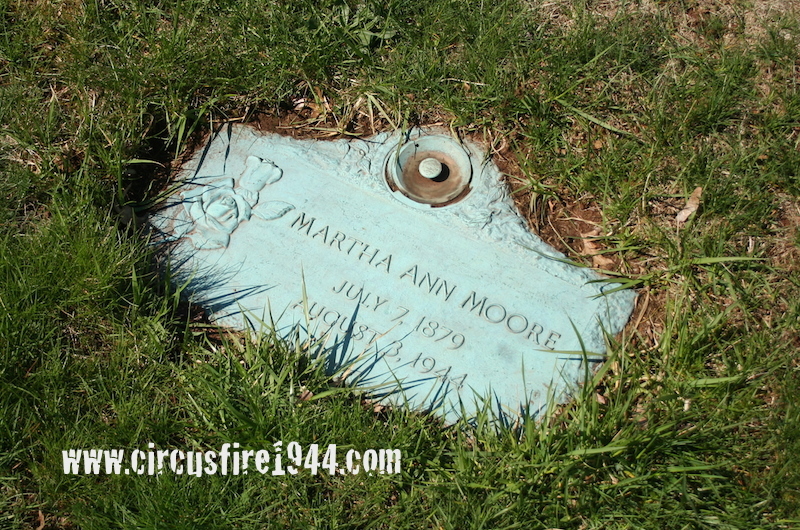 Mrs. Moore attended the circus with her daughter, Mae Avery, and grand daughter, Sandra Avery, who both lived with Martha, and also another grand daughter, Janet Moore, all of whom survived. Martha's estate was awarded $13,500 by the arbitration board. Martha's grave marker at Rose Hill Cemetery.